Do you love doing skateboard and surfboard art? Then you are probably one of the hundreds of artists who rely on Uni Posca markers and other selections to complete their creative pieces. Markers 4 U, Inc., offers high-quality solid paint markers that are perfect for making unique, colorful, and exciting skateboard and surfboard art. With any paint marker offered here, you’ll be able to bring your ideas to life in full color! Discovering the right markers for your art is never easy. Many artist look high and low for great markers, spending hundreds and hundreds of dollars on markers that just don’t do the trick. When you shop with us, you can feel confident that you’ll find the perfect paint marker at a price that will fit your budget. After all, we know that artists don’t always have big budgets to create their masterpieces. 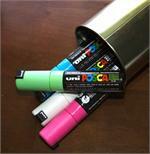 Take a look at the Uni Posca markers we have to offer and order solid paint markers for your works today.